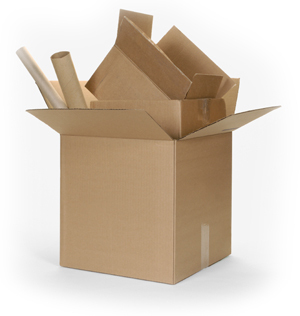 Yes, we are moving! We found renters and we are heading out. Exciting? Yes. We are very excited. We found a great place up in Scottsdale and we are stoked to be closer to Scottsdale Bible Church. But, I’d be lying if I said that I wasn’t sad to leave this house though. All of me wishes we could just pick up this house and move it to Scottsdale with us. So we are entrusting it to a good family and praying that it will be well taken care of like we have taken care of it! So in a week from today, we will begin the move out process. We’ve been blessed with a great situation that’s allowing us to move out slowly, to deep clean the house for our renters and for this prego lady to take a pretty big move at her own pace! I’m grateful at how God’s taken care of us through this entire process. Ever since Jay was laid off all the way up until now. Why do I still doubt sometimes? Geez. You’d think I’d learn by now. So these next few weeks are going to be INSANE. Tomorrow I’m leaving to head to San Diego for a Boudoir Session that I was hired for. It’s also turned into an all girls weekend, (which I can gladly check off our list!!) and is definitely something that I NEED. It’s been a stressful time, these past few weeks, and although I am going out there to work, I am thrilled to have a little time to relax. It will most likely be my last girls weekend getaway before Rider is born. I can’t wait! Once I get home, it’s time to pack pack pack! And work work work! We have so many edits we are working on for Session Nine Photography, so I have to manage a way to stay on top of that too. SO, the next couple weeks are going to be exhausting. But at the end of it all, we will be up in Scottsdale and in the community where Jay works. So it’s obviously going to be totally worth it. Life never slows down. I’m hoping it does a little bit after we move. Six months ago I never thought we’d be here. And although it’s been somewhat of a lonely road, I have never been more grateful and more happy to be where we are. I’m glad we’ve made it here. I thought I’d post a few cute pictures of Cruz that I’ve taken in the past few weeks. I know that I’m always posting pictures of Cruz, but I can’t really help it. I’m a photographer and he’s a super easy subject. And one that I’m obsessed with. Ha! Plus, you guys. I have so much to share with you. SO MUCH. So much, that I’m not even sure where to start. Even if you know me well and we talk all the time, you don’t even know the half of it. It’s a crazy time for us. So I’m not going to talk about it, just yet. I know that’s probably cruel, but I just have too much to say and some unanswered questions about our job situation, moving situation etc plus some other stuff so I’m just not ready to share. That’s why my blogging has slowed down a little bit. There’s so much going on and it feels super weird to post about other things than what is actually going on. But I’m not ready to talk about everything that’s happening so it’s hard to blog at all because I desperately want to be honest about the events in our life. It’s always nice for me to take a step back and just wait for a little bit until I’m ready to unveil everything. Until then, I thought I’d post a few pictures of Cruz here. He’s such a super fun kid and while we are slightly stressed, making decisions, and overwhelmed at times, this kid keeps us smiling every single day. And we are so grateful for this little dude and all the cheer he brings to us. He’s a special little guy who is almost always happy, goes with the flow, and says the funniest stuff already. I can’t wait until he’s saying full sentences because I just know that we are guaranteed some hysterical laughs! Most of these pictures were taken with my phone, so please excuse the quality. 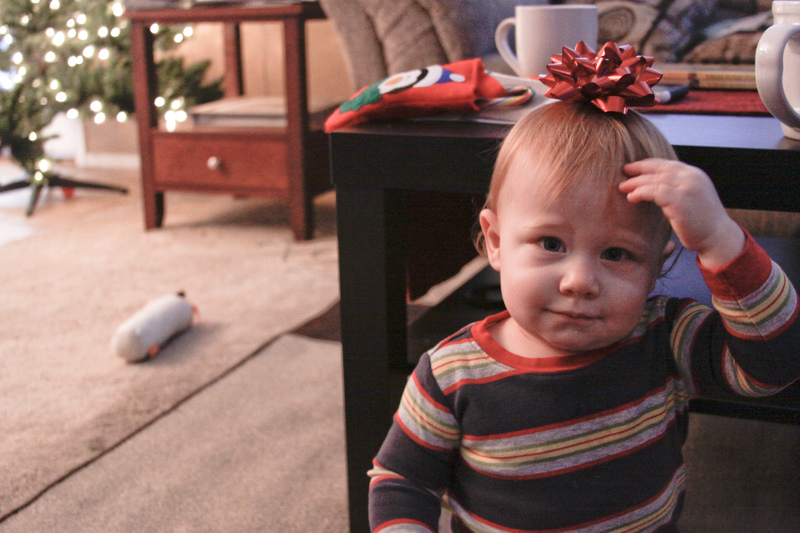 This first picture was taken on Christmas morning. I’ve been meaning to post it since then. I mean, seriously? Does it get any cuter? Gosh, I just want to pinch him all day long! 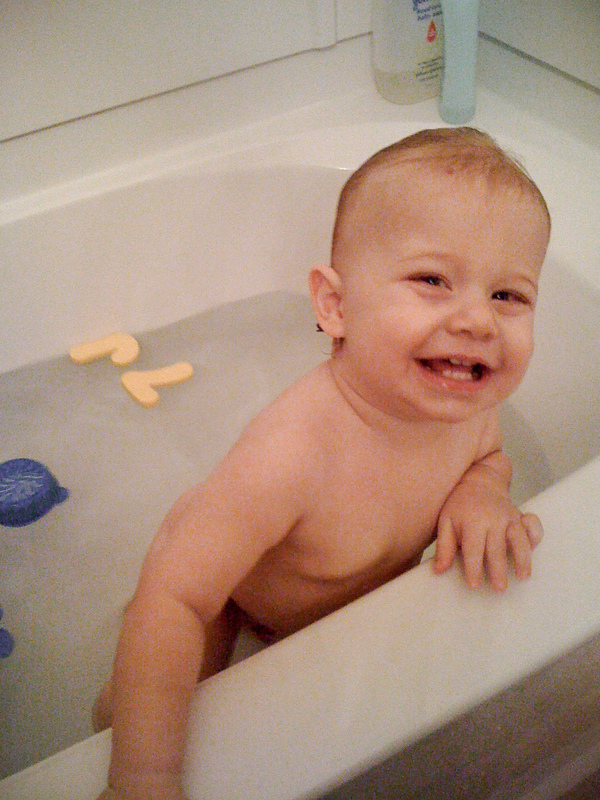 Cruz loves, loves, loves bath time. He asks to take a bath on some occasions. 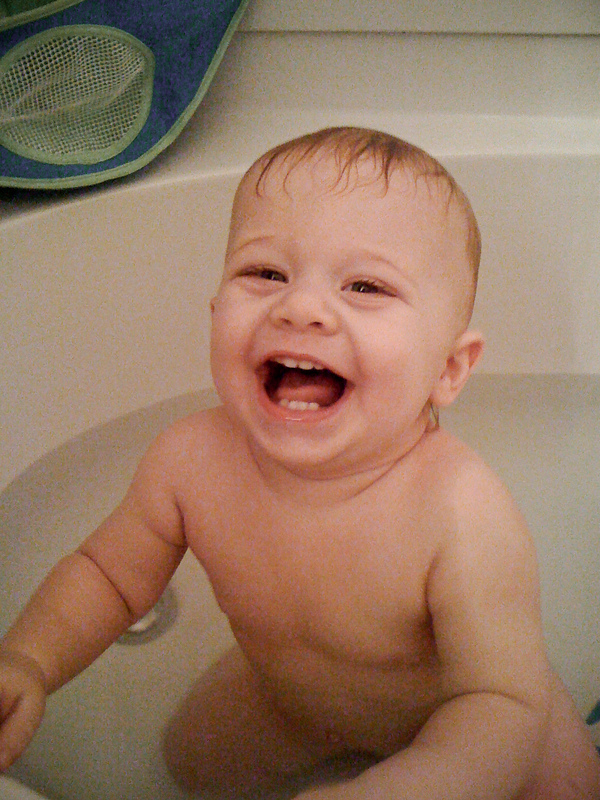 Some of the happiest pictures I’ve taken of him are in the bath! 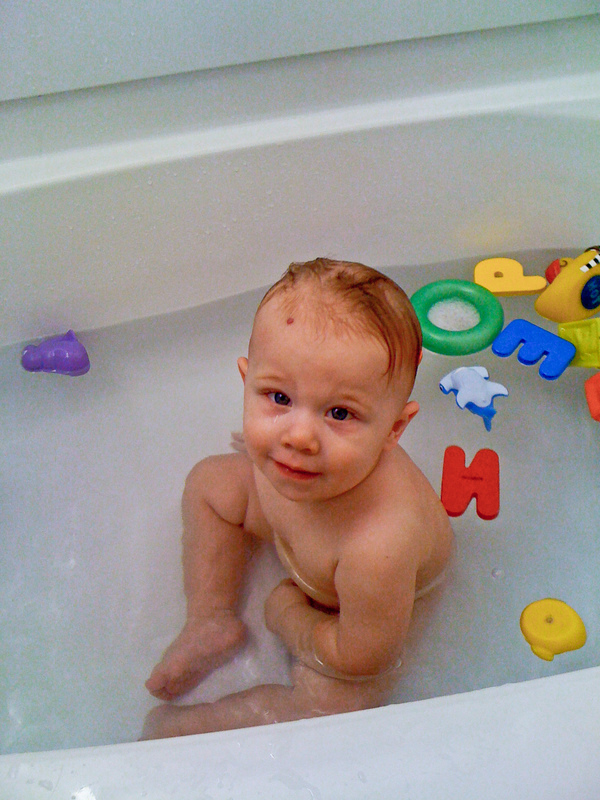 He loves the water, the toys, the soap- all of it. 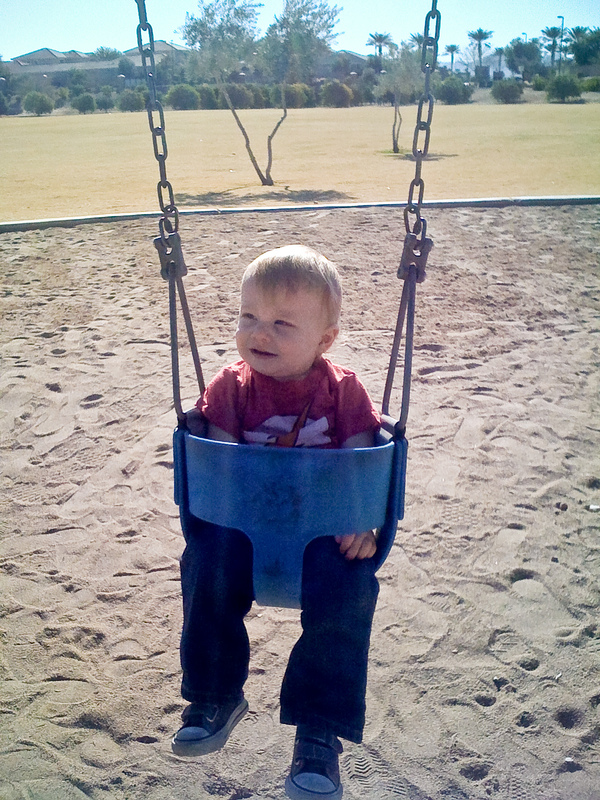 This was Cruz’s first time in a swing! This is at a nearby park by our house. He loved it. 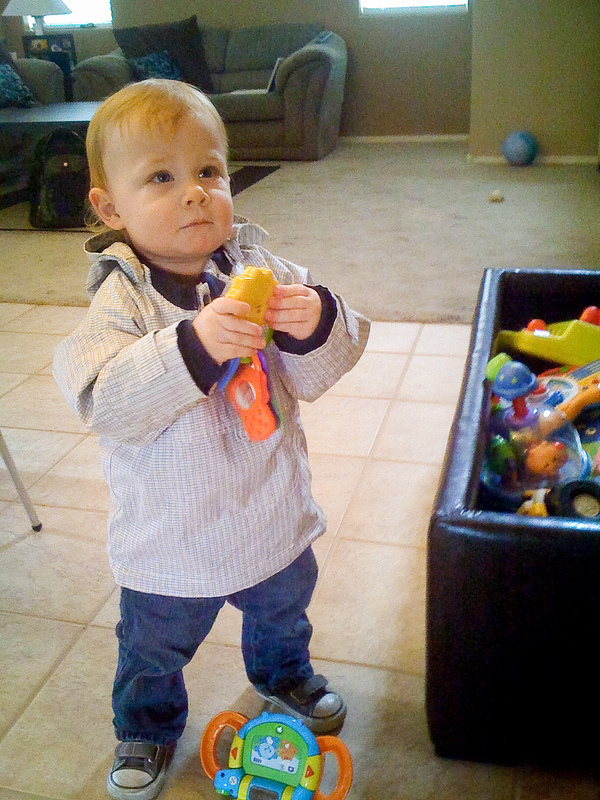 And this is his new jacket I got him at H & M. I’ll have to tell you- I was NOT impressed with their kids section- at least for the boys. But I did find this jacket for $20, which is too much to spend on a jacket in my opinion. But I went for it because he needs a better jacket than the one he has. And I haven’t really seen one that looks like this- it has a zipper that zips down the side. Which is actually a bigger pain than I thought it would be. But he’s a cutie so it’s worth it! He’s the best. Have I said that before? Ever since Jay was laid off from his job, I have really felt the need to simplify our lives. It’s weird. I’ve never felt more free, more liberated and more excited for our future than I do right now at this moment. It’s like we can go anywhere and do anything- the options are endless. We are in a great position and I never thought even a month ago, that I could possibly be this stress-free. I’m ‘breathing’ about a lot of things for the first time in a long time. Yesterday, I was catching up on the shows that are on our DVR, and I will proudly admit that I love watching Oprah. She did a show on how different people live all around the world and I was just fascinated. It made me want to travel all around the world in the worst way ever and it inspired me tremendously. I was specifically fascinated with how the people live in Denmark. Everything just seems so much more simple. I would love to live in a place where I can take my bike instead of my car and where I can walk to the market. She went inside a couple of homes there, and I found myself wanting to live like that. Why do I need a huge house? Living in a loft or town home suddenly seems so appealing to me. Jason and I talked about how people with pretty big families live in very small homes, all over the world! Why do I need all this ‘stuff’? There’s nothing wrong with having a big house- we are in one that we are still growing into! But I’m finding my ideas of happiness shifting. We are still trying to decide where we are going to go and what we are going to do. Are we going to move? Are we moving out of state? Are we staying here? Working at a church? Just working our photography business? Maybe both? We are considering everything and anything is possible. We could be across the nation in 30 days if the right opportunity presents itself- that’s how open we are. Or we can stay here if that’s the right opportunity. All I’m saying is that I am digging deep into myself and my ideas of happiness, home, style and life- is changing. So what is the point of this post, you ask? Simplifying is where I’m at. Not that we’re moving to Denmark or anything (well, not today at least! Ha!). But my favorite thing about where we are at is that we are going to start over. Whether down the street or down South. I’ve never felt this excited and liberated! * These pictures are of a couple apartments in Denmark that I loved. I love the cleanliness and the simplicity of it. Beautiful. I had a big ‘ol sha-bang planned for Cruz’s birthday, which is a little over a month away. Now, due to our current circumstances, we’ve had to scale back a little bit. And that’s fine- actually, it’s helped me remember what IS important here. And he’s not going to remember anything about this day, except for what he sees in the pictures that we’ll keep forever. What’s important to me is that all of our friends and family come and that this little guy looks back on his first birthday and knows how loved he is. We have some of the greatest friends and family- I mean, people who have just surrounded us during this time in our lives. It’s been so comforting and we really are starting to feel excited for the future! I can’t believe that this time last year I was still pregnant with Cruz. It is crazy how fast time goes, and it’s the most cliche thing to say, and something that every mom I’ve ever met says. But it is so true. My little boy is almost 1. I was looking at good shoes for him today because he’s going to start walking soon and I want to make sure he has some good looks for his little footers! But that is crazy. When he wasn’t even born yet, I had no idea how fast this year was going to go. And truly, how much our lives were going to change. Everything has changed. Everything is different. We never thought we’d be here. But I am excited to venture onto the 2nd year of Cruz’s life. And as we plan for his big party, it’s a lot easier for me to keep focused on what truly is important. We don’t need to spend a lot of money to make his party huge and fantastic. All our friends and family will be there, celebrating our little boy who’s changed our lives so- and who we are so thankful for and blessed by. Every birthday we pass will be a celebration of life. The life of a special kid who brings out the best in us. I had a great conversation today with a gal that I used to see every Sunday when I worked for the church. We don’t know each other too well, but she is so sweet and a pleasure to talk to when I see her. Today she confirmed some thoughts I’ve been having. And made me feel like I wasn’t so alone. Her story is somewhat similar to mine- she’s ahead of me in that her kids are a little bit older than Cruz- but she was married for 5 years before they had kids, she started having children a little bit later in her twenties, and she worked all of her adult life leading up to then. That’s me. I have worked since high school- sometimes multiple jobs at a time. I’m very much a go-getter. I’m independent, self-motivating, a hard worker and love doing things on my own. I have lived all my life doing things for myself. Sound selfish? Probably. But you know you’ve been there too. I got married and honestly, marriage is hard work, but it wasn’t a hard adjustment at first really. We figured each other out and have been happy ever since. 5 years of just us two is a good amount of time to get comfortable with it just being the two of us. Having a baby has enhanced our lives in more ways than I can count. Cruz is the biggest blessing- I’ve always wanted to be a mom and we couldn’t have asked for a better baby than him. He’s an easy baby too- so happy and so easy. Being a mom’s hard sometimes, but Cruz is a pretty easy going kid. But I’ve struggled with some aspects of ‘mommyhood’ and I haven’t been able to put my finger on why, really. I mean, I know it’s hard and everyone struggles. But there’s been a part of it that I’ve been fighting and I haven’t been able to figure it out. It’s because having a baby has completely changed my life. It’s completely changed me. How could it not? You’d have to be pretty naive to think that you are going to be the same person you are now, after you have a baby. I think it’s not possible. I’ve just grown so much in the past 7 months- my whole entire world has changed. I wouldn’t change anything- except being exhausted ha! I really do love it, but I never expected to ‘grieve’, somewhat, the life of independence I’ve left behind. To adjust my entire world around this little being who has to depend on me and Jason for everything. I am learning new things about myself everyday- new emotions were born inside me through this process. Even the way I view certain friendships is different. That’s been the hardest of them all. Adjusting to how people view me now and working through those insecurities. Trying not to be the stereo typical “high strung” mom in some’s eyes- when I’ve come to realize that if you view me as high strung, you don’t know me at all. I’ve grown and I’ve changed. I’m thankful for the change because I feel like I am becoming the best part of me possible. Cruz is bringing that out in me and I’m constantly learning new things about myself- which is scary because pre-baby I thought I knew myself pretty well! It’s been a place of discouragement to me- to feel like people don’t understand me. To know that some people talk about me and how I’ve been stressed. I’ve just been really discouraged. Until today. Today I no longer feel alone. My dear friend in the hallway helped me to realize that I am not the only mom that has ‘changed’ since having a baby. She even helped me to realize the every woman changes after having a child. Every woman thinks they will be the same afterwards. How can you be? Your life is changed forever. Your eyes are opened to more things that you ever thought possible. And you view the world differently that you ever thought you could. You can’t be the same. I bet she never thought that she would comfort me the way she did today. I bet she never realized how God would use her to remind me that I’m OK. It’s OK to grow and change- even if people don’t understand. It’s OK to be different after going through a major life experience. It’s OK to surrender to it and enjoy the ride and the growth. So I’m going with it. I’m sure some people still won’t understand. I’m focusing on surrounding myself with people who ‘get it’. And I’m happy to say, that what you see is what you get.